Welcome to the free weekly edition of Popular Information — written by me, Judd Legum. 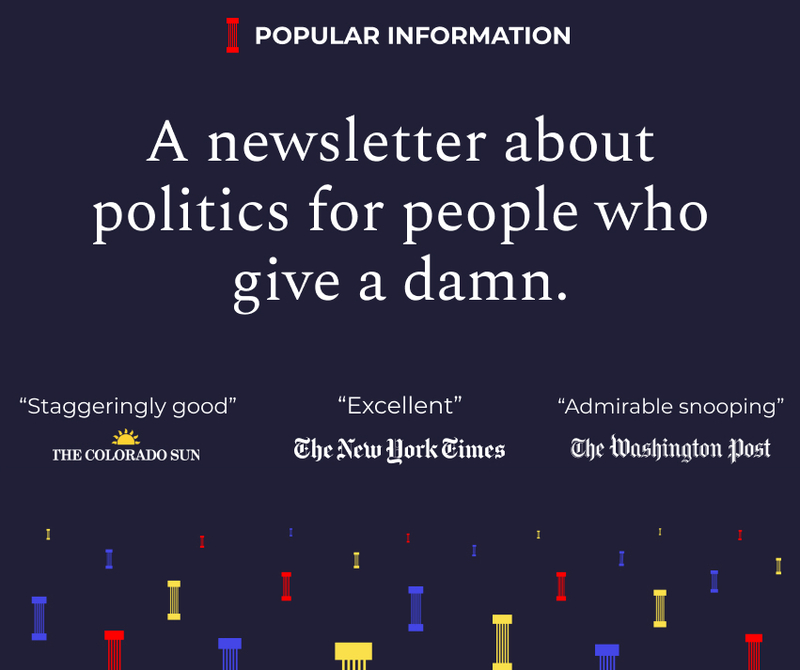 Popular Information is a different kind of newsletter. It doesn't just summarize the news; it makes an impact. Over the last month, as Tucker Carlson said immigrants were making America "dirtier" and argued there was a moral obligation to pay men more than women, Popular Information shined a spotlight on the corporate advertisers supporting his show. Since that time, 30 companies have announced they are pulling their ads from Carlson's show. Last Monday, we highlighted Red Lobster's decision to continue advertising on Carlson's show. By Tuesday, the company announced it reversed its decision. You can support independent journalism that holds the powerful accountable -- and get Popular Information four times per week -- with a paid subscription. It's just $50 for all of 2019. Since Popular Information launched in 2018, it has consistently demonstrated the ability to break through the noise and create change -- from Steve King to Cindy-Hyde Smith to the election fraud scandal in North Carolina. Popular Information is just getting started. Even more is possible with your support. You can also subscribe monthly for $6. Contact me with any questions at judd@popular.info. Steve King, a Republican Congressman from Iowa, was quoted in the New York Times last week openly embracing white supremacy. “White nationalist, white supremacist, Western civilization — how did that language become offensive? Why did I sit in classes teaching me about the merits of our history and our civilization?” King said in an interview. The remarks were part of a long pattern of racism from King. He endorsed a white nationalist for mayor of Toronto. He retweeted a neo-Nazi and said, "I'm not sorry." He criticized Obama for apologizing for slavery. "There's nothing to apologize for until they come and thank us for the things we’ve done," King said. And yet, King is not just welcome in the Republican Party; he is setting the agenda for the entire country. Yes, some Republican officials have condemned King's latest remarks. But the government shutdown, which is entering its 23rd day, is about turning King's signature issue — a 2,000-mile border wall — into reality. King continues to have a place in the House Republican Caucus, and numerous members of Congress -- including one Democrat -- continue to co-sponsor his legislation. Despite his unapologetic racism, many members of Congress still feel comfortable collaborating with Steve King. There are 82 Republicans who have co-sponsored legislation this Congress that was introduced by King, and one Democrat -- Congressman Collin Peterson (D-MN). Peterson is a senior member of the Democratic Caucus, serving in Congress since 1991. He was recently appointed the chairman of the House Agriculture Committee. King touts his collaboration with Peterson on his website as proof of his "bipartisan" agenda. King's legislation takes aim at California's Proposition 12, which requires that all eggs sold in the state come from cage-free hens by 2022. The bill would prevent California from imposing the regulations on imports from other states. King's collaboration with a powerful Democratic committee chair is an example of why King has been able to espouse racist views as a member of Congress for more than a decade. While he occasionally receives criticism from his colleagues, he is generally treated like everyone else. Peterson signed on to King's bill on January 8. Popular Information asked several members of Peterson's staff if he would continue to collaborate with King even after King’s most recent statements about white supremacy in the New York Times. No one from Peterson's office responded. Dozens of Republicans continue to sign on to legislation sponsored by King, including several bills that were introduced after his remarks to the New York Times were published. Congress has only been in session for ten days but 82 Republicans, 41% of the entire caucus, have signed onto bills sponsored by Steve King. Eighty of these Republicans are white men, and two are white women. Some of King's legislation is directly tied to King's white nationalist agenda. One of King's bills, for example, would only grant citizenship to babies born in the United States if one parent is a citizen or permanent resident. In other cases, Republicans have made King the face of social conservative causes, like his bill "to prohibit abortion in cases where a fetal heartbeat is detectable." "This just popped up Friday"
While several Republicans, including Minority Leader Kevin McCarthy and Minority Whip Steve Scalise, have issued statements condemning King's recent statements about white supremacy, it's unclear whether the party will take any meaningful action. In an interview with the Washington Examiner, King said that "none of his colleagues in leadership sought him out demanding an explanation" and no "punishment — the loss of committee assignments or otherwise — been threatened." According to a senior House aide who spoke with the Examiner "no action is planned." King added that "no Republican leader in Iowa has called him to complain or criticize, either at the county level in the 4th Congressional District he represents or at the state level." That could change soon. On CBS, McCarthy said that he was meeting King on Monday to have a "serious conversation" and "action will be taken." On ABC, Scalise was even vaguer, saying that he would "would imagine we’re going to continue talking about this." "This just popped up on Friday," Scalise claimed, ignoring King's record of white nationalist rhetoric for more than a decade. Scalise and McCarthy declined to criticize King for similar remarks about white nationalism last October. As Popular Information reported, Scalise and McCarthy both contributed to King's 2018 campaign through their leadership PACs. McCarthy and Scalise claimed Democrats ignored similar conduct in their own caucus. Scalise said that "many Democrats" have "aligned themselves with anti-Semites." McCarthy said Democrats "do not take action when one of their members say something like this." Neither explained who or what they were talking about. This is officially the longest shutdown in U.S. history. The reason the government will not open is Trump is insisting on funding to begin construction of a 2,000-mile border wall. Trump has shut down the government to pursue Steve King's vision. In 2006, long before Trump was even thinking about immigration, Steve King went to the floor of the house and demanded the construction of a 2,000-mile border wall. King brought a model of the wall, which he designed himself, and constructed it as he spoke. He said the top should be electrified, comparing immigrants to livestock. I also say we need to do a few other things on top of that wall, and one of them being to put a little bit of wire on top here to provide a disincentive for people to climb over the top or put a ladder there. We could also electrify this wire with the kind of current that would not kill somebody, but it would simply be a discouragement for them to be fooling around with it. We do that with livestock all the time. King, as you can imagine, could not be happier that Trump has shut down the government to pursue his vision. He tweeted out encouragement, along with a request to stick with his original concrete design. Mr. President @RealDonaldTrump if the time comes that it is necessary for you declare a state of emergency for border security, build the whole wall out of concrete. Let it stand forever as a monument to the Rule of Law. Trump has invited King to meet with him in the Oval Office. "I market-tested your immigration policy for 14 years, and that ought to be worth something," King says he told the president. The Congressional Black Caucus (CBC) is sick of all the talk about Steve King. It wants action. CBC Chairwoman Rep. Karen Bass issued a statement calling on Republicans to strip King of his committee assignments. If Republicans really believe these racist statements have no place in our government, then their party must offer more than shallow temporary statements of condemnation. Instead, they must actually condemn Mr. King by removing him from his committee assignments so that he can no longer affect policies that impact the very people he has made it clear he disdains. Republicans are trying to move on from King's comments by condemning them. The CBC is demanding something more. It wants other members of Congress to stop empowering King's white nationalism by collaborating with him. No matter what Republicans decide to do, Democrats could censure Steve King with a simple majority vote. A Congressional censure is largely a symbolic move but does involve King standing in the well of the House while his colleagues formally rebuke him. Some Democrats, including Congressman Tim Ryan (D-OH), are interested in pursuing this course. Ryan is reportedly drafting a censure resolution. A vote would also force every Republican to go on the record regarding King's conduct. Pelosi has not committed yet to a censure vote. Congress could also move to expel King from Congress, but that requires a two-thirds majority vote, which seems unlikely. Voters will get a chance to expel King in 2020 and he has already drawn a formidable challenger in the primary. In 2018, King won his bright red district by just three points.